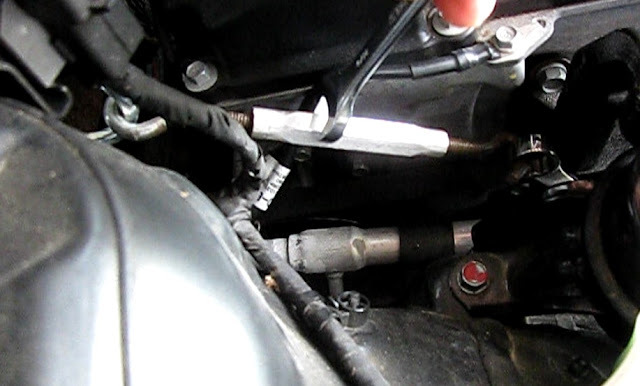 This post covers removing and installing the serpentine belt on a 2011 2.4 Hyundai Sonata. If a serpentine wrench will fit in the limited space available on this engine that would be the preferred way to do this job. The method shown involves using common tools to find a means to hold the tension off the belt in order to make removal and installation easier. This enables one person to much more easily perform this sometimes frustrating job. Tools: Serpentine wrench or optional: 17mm combination wrench, medium size turnbuckle, large "S" hook. 2) Place the open end of the 17mm combination wrench on the tensioner nut so the wrench is as close as possible to the firewall side of the engine mount. 3) Place the tension holding tools. The "S" hook goes on a bracket on the wheel well. Place the turnbuckle between the hook and the box end of the combination wrench. Tighten up the turnbuckle until the tension is removed from the belt. 4) Remove the belt. Leave the holding piece in there and take it off the alternator first. Then pull it off the crankshaft and squeeze it together and pull it out between the tensioner and lower idler. Take it off the water pump and ac compressor and remove from between the lower idler and tensioner. 1) Leave the holding tools in place. Slip the compressed belt between the lower idler and the tensioner and slip a loop around the crankshaft, ac compressor and up around the alternator. Leave it on top of the lower idler for now. 2) Slip another loop of the belt between the upper idler and tensioner and around the water pump. Thank you for the instructions. I can't believe I can't even fit my serpentine belt tool on the tensioner pulley. Just no room in there. I like your solution. I'm going to try to use a deep offset 17mm and cut off the 19mm side and see if I can do it the traditional way first. If that fails, I thank you very much for my plan B. Thanks for listing the tools too. Yeah the space to do this job is very limited. I'm not surprised a serpentine tool won't work here. I hope your idea works. Serpentine belts can be so frustrating. That's why I take the time to try to find an easier way to do it. Thanks again for the comment and good luck. No, I don't take off the holding tools to remove and install the belt. The trick is to slip the belt off the crankshaft,water pump and ac compressor and then kind of squeeze it together, kind of make it skinny, and slip it up between the lower idler and tensioner. Then put it back in reverse, finishing by slipping it over the lower idler with a long screwdriver. This is a tougher serpentine belt due to limited space but it can be done this way. I hope this helps and thanks for using the tutorial! David, Thanks. I previously had a supercharged Grand Prix and got quite fast at changing the serpentine belt. It does appear that Hyundai has made the task far more difficult then necessary. I ordered the belt and turnbuckle and when my belt shows some wear I'm going to rely on your innovative method. 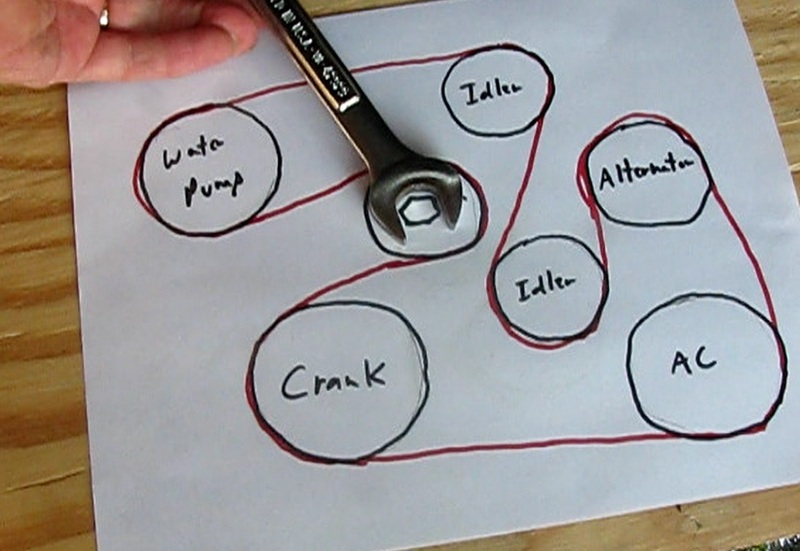 Do you have the diagram for a 2009 Hyundai sonata limited 2.4l? Thanks for the info. I was changing the alternator on a 2013 Optima and had instructions from KIA but they simply said "turn belt tensioner counter counter-clockwise". With your instructions I was able to understand how it works. I didn't use a turnbuckle but was able to use a wrench and push it with a hammer while I maneuvered the belt. Hi. Disconnecting the battery not messing up the computer in the car?